Mc Finlay's 5 top tips for a feeling of lightness. I - Humidity A new shoe should always be worn in a dry environment, it hardens the sole and gives a rough finish that helps shed water. If your shoes are wet, let them dry at room temperature before reuse. A wet leather sole wears two times faster than a dry one. It is best not to wear wet shoes and let them dry at room temperature. II - Storage Use a plain wooden shoe tree to keep their shape and help absorb moisture. Use a shoe brush before storing your shoes to remove dirt and preserve the leather. Keep your shoes in their pouch or in their box to prevent from outside elements such as dust or sunlight. III - Preservation Leather is porous, it breathes and is not naturally waterproof. It is best to wear your new shoes for a few hours only, and repeatedly. 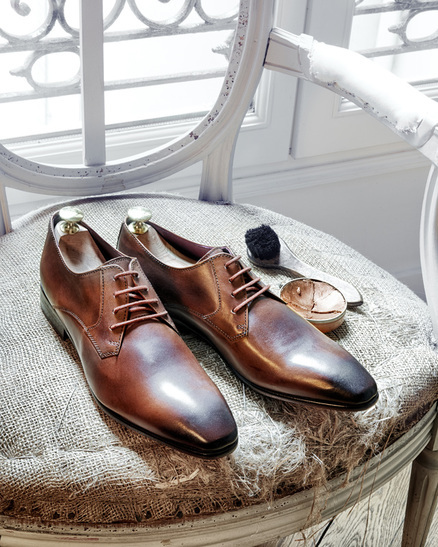 Allow time for your feet to get used to your shoes and for the leather to take the form of the latter. Generally, they must be worn alternately (every other day, for example) in order to let the leather rest. IV - Wearing Always use a shoehorn to put on your shoes. This prevents damage to the heel counter and increases your shoe lifespan. V - Waxing Before waxing your shoes, make sure they are completely dry and clean with a soft cloth to remove dust and dirt. Use a good quality shoe polish, we recommend beeswax, which helps maintain moisture levels and appearance of leather shoes. Take the time to rub the polish into the leather. This is beneficial in the long term and limits the cracks and crimps. Do not forget to apply the cream to your shoes. The cream is used to maintain ans feed the leather. How to properly shine your leather shoes. ​Dust off your shoes with a soft brush to start.Remove traces of dust or mud. Take a soft toothbrush and gently rub the leather insist on creases and edges of the sole. Apply a cleansing and nourishing cream on your shoes with a soft cloth after the leather is rid of all its residues. Let dry. Choose a colored wax. Once the cream has penetrated the leather, begin the waxing process. Using a small brush, called palot, draw wax into the box and apply on the shoe. Start with the sides on the welts in a back and forth movement. It is advisable to choose a wax of the same color as the shoe. Let dry. Wax the arch of the sole. Once the wax is dry, brush the leather one more time. Finally, wipe with a soft cloth or tights rolled into a ball, to make the shoes shine. Once you have highlighted the shoes and it shines, let dry a bit before putting them on. They will be better waterproofed and the shine will last longer. How to maintain your suede shoes ? Start with a good shampoo. Brush your shoes before washing in order to remove all dust, and put on shoe trees. Clean with Marseille soap. After washing, let dry on shoe trees, so they do not deform and let dry near a heat source. Let dry. Restore the skin's hair using a special suede brush, that has harder bristles made out of brass. Perform back and forth movements until you get the desired effect. Wax the edge of the sole. To revive colors on the edges of the sole, you can shine it with a colored wax and a soft cloth. Be careful not to stain the skin during the operation. To prevent smudging, you can attach an adhesive tape over the edge. Let wax dry before the next step. Apply waterproofing treatment. You can find "special suede" aerosols in specialized shops. You can choose the colored ones if you want to sharpen the tone of your shoes. Apply evenly and let dry thoroughly. Finally, brush the skin once more. Always keep a back-and-forth movement. The suede will look brand new.